Since 18 April, 41 Syrian refugees including women and children are stuck at the Algerian-Moroccan border – without access to health care, food or sufficient drinking water. Humanitarian support for the refugees and access to their right to protection is urgently needed. UNHCR has to get access to the protection seekers without delay. 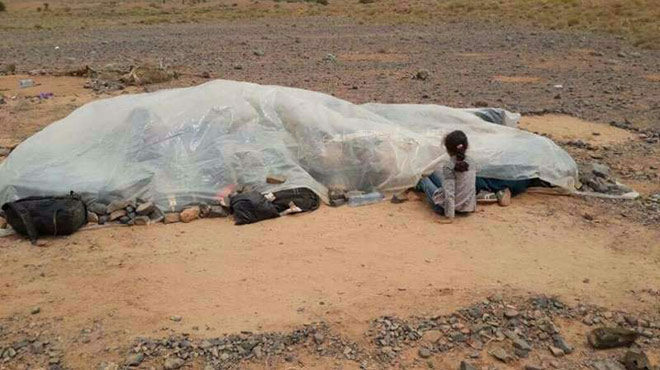 As a result of the mili­ta­ri­zed clo­sure of the bor­der bet­ween Moroc­co and Alge­ria, 41 Syri­an refu­gees are stuck in the desert sin­ce one month in the desert bor­der­land bet­ween the two coun­tries. Moroccan aut­ho­ri­ties announ­ced to allow access to their ter­rito­ry to 9 per­sons becau­se they had fami­ly mem­bers living in the coun­try. For the others, neit­her Alge­ria or will allow them to enter their ter­rito­ry. Until now, the High Com­mis­sio­ner for Refu­gees (UNHCR) has been denied access to the­se peop­le. Euro­Med Rights has sent a request to the UN Spe­cial Rap­por­teur on the human rights of migrants on 11 May 2017 cal­ling for his urgent inter­ven­ti­on to Algiers and Rabat. Among the pro­tec­tion see­kers are a pregnant woman and a child suf­fe­ring from can­cer, the­re have also been cases of diar­r­hea and sca­bies. The group is expo­sed to alar­ming con­di­ti­ons: They lack sup­ply of food and drin­king water, the tents are in poor con­di­ti­ons, the peop­le are expo­sed to harsh wea­ther con­di­ti­ons and left wit­hout pro­tec­tion. It is a mat­ter of urgen­cy that Moroccan and Alge­ri­an aut­ho­ri­ties imme­dia­te­ly gua­ran­tee access to their ter­ri­to­ries for the stran­ded per­sons, to pro­vi­de them with huma­ni­ta­ri­an aid and to allow them to imme­dia­te­ly con­tact UNHCR in order to get access to a pro­per asyl­um pro­ce­du­re. For tho­se who have fami­ly mem­bers in Moroc­co, Alge­ria or other third coun­tries – some have fami­ly rela­ti­ons to Ger­ma­ny and Swe­den – their right to fami­ly reuni­fi­ca­ti­on has to be exami­ned and gua­ran­te­ed.